Anna Sui Fragrance and Perfume for Women from Slapiton. Anna Sui is an acclaimed designer in women's fine fragrance. In 1999 she launched Anna Sui, which was very successful, and following this success has launched the equally popular Sui Love, Dolly Girl and Dreams. These fragrances are beautiful and distinctive, due to her addition of oriental notes into traditional floral and sweet marine bases. Anna Sui Dolly Girl, for example, has green leaves and tea added to a traditional rose base. The Anna Sui range is also popular because of the beautiful bottles she has designed to house these fantastic perfumes. Escape into a fantasy garden with Anna Sui's Fairy Dance fragrance and its shimmering, warm, seductive tones. 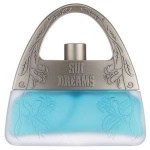 Anna Sui Flight of Fancy is a luscious and young floral and fruity fragrance, an unusual and exotic fragrance that caresses the senses and creates a relaxing ambience.